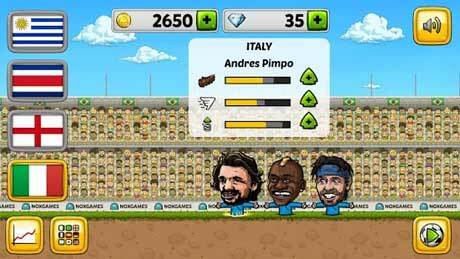 Smash the football and score goals in this addicting soccer game! 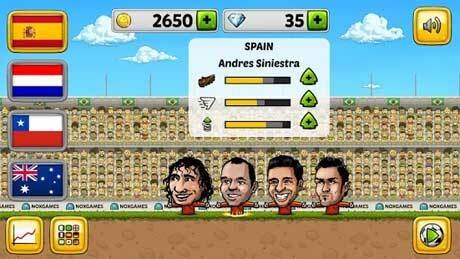 Pick your favorite worldcup team and play as a famous footballer. Tactically play offense and dummy defense as you ascend the World Cup 2014 ladder! The path to victory is never easy, so unlock bonus’ that will drastically increase your marionette teams chances at a Gold Medal! Aim your big head headers and perfect your kicks to destroy your opponents dummy defense. Use the slime, ice, and gum to your advantage in offense! Be The Nox Pigskin Puppeteer! Feel the atmosphere of Brazil 2014 in sock Puppet World, great football stadiums in Brasilia in this epic marionette tournament. Watch mexican waves pushing your offense skill to the max but don’t hazard. 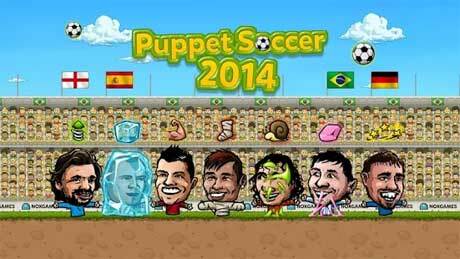 Upgrade your offense skills & unlock new hilarious sock puppet characters as you collect coins for goals and victory. Who will be the best puppeteer? Game on! Show your football offense skills, bend it like Beckham,kick free kicks like Pirlo or Carlos,Ronaldinho,handle the ball like Zidane,Figo,Lampard,Rooney,Eto,Nakata,Nakamura,Zizou,Ribery,Tevez .Marionetas without feet can still kick the pigskin pretty well. Play hazard solo like Neymar or dribble like Maradona,Ronaldinho,Davids,Falcao,Balotelli,Roben,Persie,Pirlo,Nakata or Nakamura. No dummy defense can stop your marioneta. Big heads of your hilarious sock puppets allow you to score from the air,but not with Hand of God.Can you score better than Puyol,Eto,Xavi,Balotelli,Pele,Zizou,Ribery,Tevez or Iniesta? If you will be good enough maybe even Obama and Putin hilarious nofeet marionettes take part in this puppeteer tournament. All nofoot dollies are ready to amuse you and give you silly puppeteer laugh li na. Don’t forget to try splitscreen multiplayer! NOXGAMES is not using any outsourcing.Beware of dummy pigskin frauds offering you creation of this app! Let us know if you wish any new marioneta in review or visit www.NOXGAMES.com or our Facebook.We might add pigskin ball to amuse you.